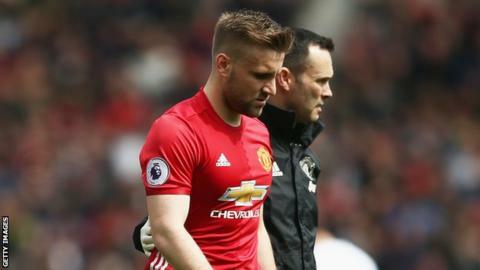 Manchester United left-back Luke Shaw will see a specialist to determine how bad the foot injury he sustained against Swansea is after a scan on Monday revealed he has ligament damage. The 21-year-old England defender left the field after nine minutes of Sunday's 1-1 draw at Old Trafford. United boss Jose Mourinho, who criticised Shaw in April, said he expected him to have a "big injury". Centre-back Eric Bailly was also forced off injured against Swansea. He joins a casualty list that includes top scorer Zlatan Ibrahimovic and fellow defenders Phil Jones, Chris Smalling and Marcos Rojo. The precise length of Shaw's absence will not be known until the specialist analyses the scans properly. In a worst case scenario, Shaw would not only miss the remainder of this season but also be in danger of missing the start of the next one in August - and there are reports the player fears this could be the case. Shaw joined the Red Devils for £27m in June 2014 but broke his leg in two places during a Champions League game in September 2015, which kept him out of the game for almost a year. He returned in August but has made only 11 Premier League appearances this season, having also suffered a minor groin tear in September. In November, Mourinho questioned Shaw for missing the Premier League win at Swansea after he said he was not able to play.